It is common for sportsbooks to allow their customers to bet on politics outcome. Whether it’s the winner of a particular race, or whether a politician will be Impeached, sportsbooks will generally offer wagers. Betting on a political outcome is nothing new. It has, however gained a new following during the past few years. It could be argued that Donald Trump brought political betting back. Bet On Politics Outcome: Where? 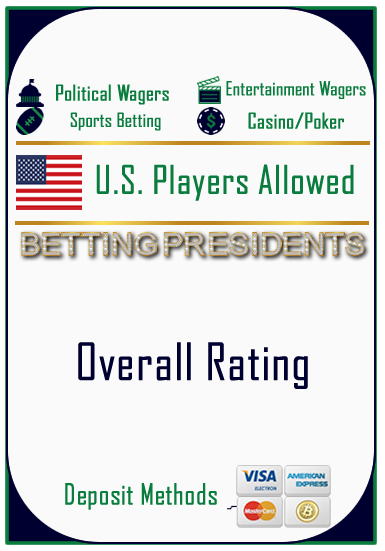 Because sportsbooks are setup for odds-style betting, it makes sense that they host political wagering. The odds are laid out the same. It fits naturally. Since most online casino’s don’t allow Americans, some shoddy operations have popped up to fill the void. Thank goodness for sites like Bovada, BetOnline.ag and Intertops With over 50 years of combined experience you’re in good hands with any of these guys. They pay their bets on time, every time. All three have great customer service. Since all 3 accept U.S. credit cards and bitcoin, you can’t go wrong with either one. Since were dealing with politics, we’ll start out with the world series of the sport. The American Presidential Election is like the world series and all-star game combined, stretched over 18 months. This is the craziest sport. With politics, there’s a lot more than just betting odds at stake. The consequences are real. Of course if you’ve got a lot of bets in on the 2018 election, for example, the consequences are real there too. 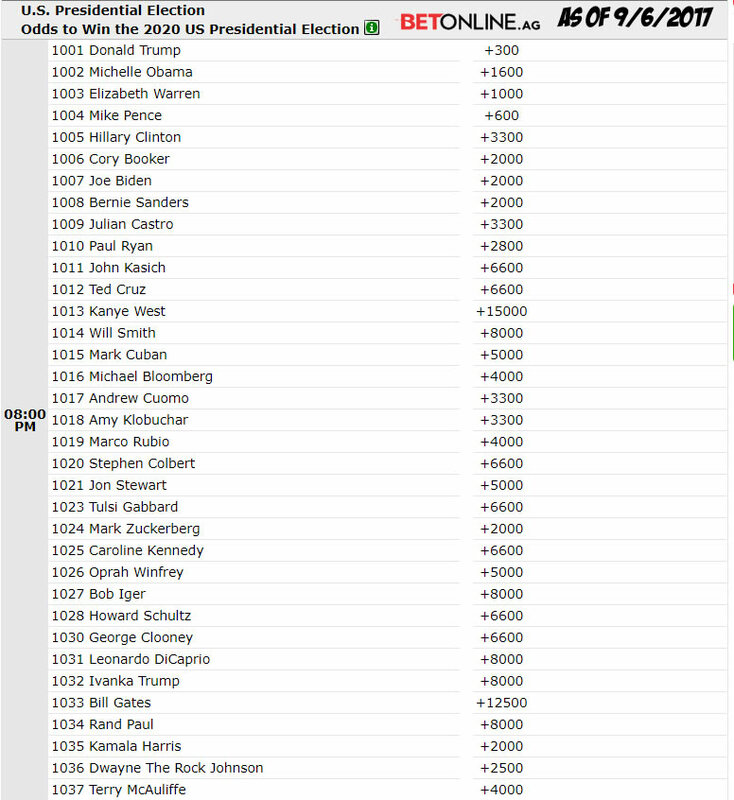 The odds for the 2020 Presidential elections from Bovada, BetOnline and Intertops are listed below. Because every sportsbook has its own oddsmakers, you’ll notice differences in all the odds listed above. 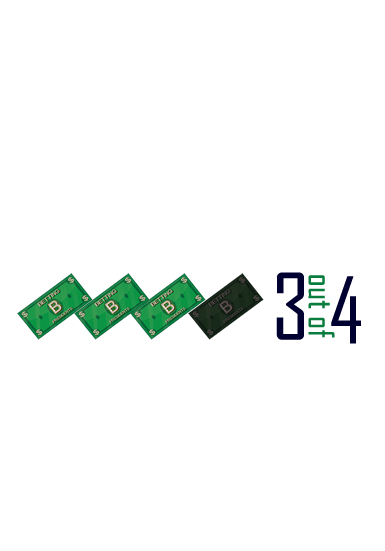 Each bookmaker has their own system. Every one of them thinks they’re right. From the top, Donald Trump is rated +250 at Bovada, +200 at BetOnline and +300 at Intertops, Pretty big disparity there, isn’t it. Picking your odds may be more important. Think Trump will be re-elected? 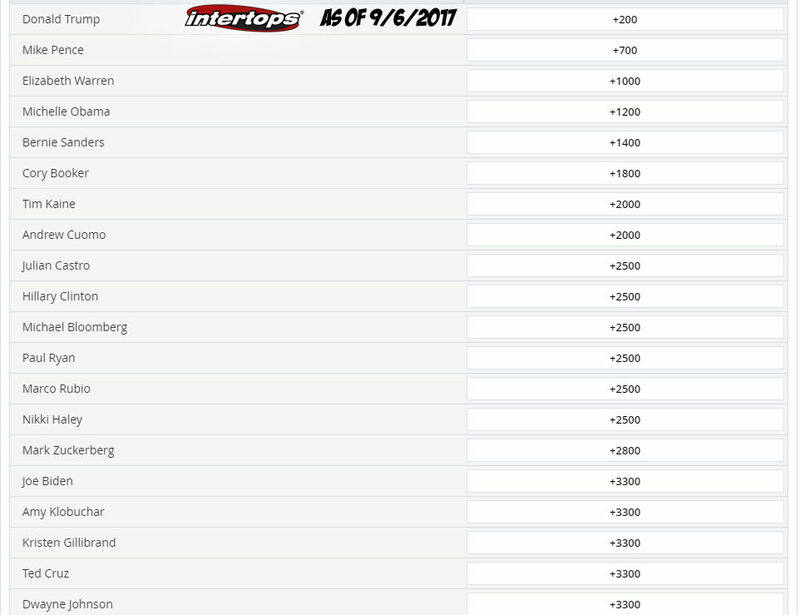 Willing to bet on it, Intertops is giving you the best odds. If you’re wrong, you loose the same amount at any casino. With a win, however, you stand to earn $100 more per $100 you spend at Intertops compared with BetOnline. Of course, odds change constantly. When news breaks, the bookmakers go to work and adjust the odds. Odds will change dozens of times in the next year. Make sure to time your bets to get the best possible odds. 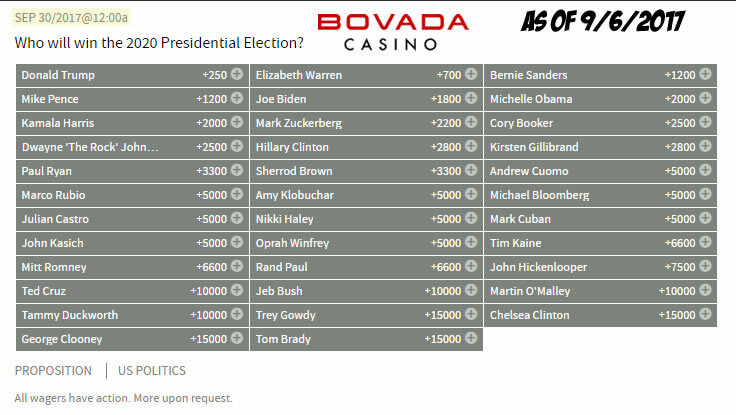 We recommend Bovada as our top choice for political betting. Probably, the main reason is their sheer volume of political props. 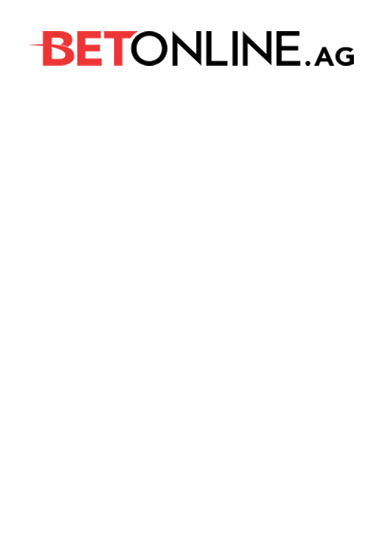 When you Bet On Politics Outcome at Bovada, you know you’ll get your money if you win. Bovada makes it easy to deposit (you can use credit cards and bitcoin). As you can see from the example above, they offer competitive odds. Best of all, they welcome U.S. players. 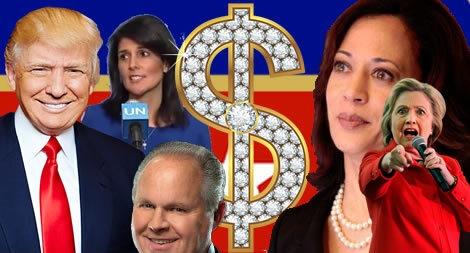 For these reasons, Bovada is our #1 recommended sportsbook for political wagers. If you’re looking to Bet On Politics Outcome, you have options. You also have to be careful. Nobody wants to loose their money, but a casino refusing to pay is unacceptable. Unfortunately, it does happen. Don’t let it happen to you. If you use Bovada, BetOnline.ag or Intertops, you’ll be fine.